Try Steve Plunkett. He puts on the (Fleetwood Farms Country Cruise-In) show in London. He owns a 58 convert. Look up the car show sight, it has his contact no. and pictures of his collection showing the 58. 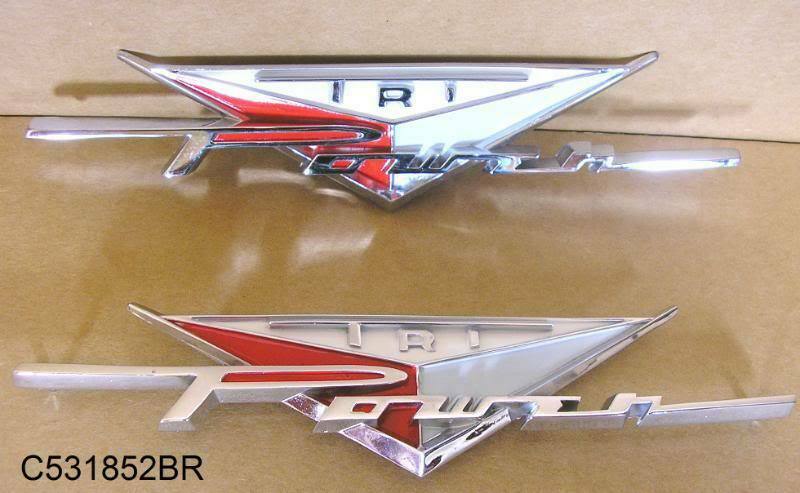 I understand that the "Tri Power" badge was only placed on US Pontiac cars like the Bonneville at the factory. Canadian cars, based on their Chevrolet counterparts never had this badge installed in Oshawa and likewise you will not find one on the 58 Impala either. "Tri-Power" is a US marketing term. In Canada the engine option was referred to as "Super Astro Flame". Canadian cars equipped with a V8 regardless of displacement received a gold V emblem in drivers side of front grille and on the quarter panels ahead of the wheel well or rear doors in the case of a 4 door or wagon. Using the 1958 Sales brochure as reference you will not see any car sporting a Tri-power badge and typically sales brochures illustrate the best of the best available to entice sales of options. Neither will you find any reference to "Tri-Power" in the Canadian sales brochure rather the option is referred to "Triple 2 barrel carburetors". Notwithstanding this it is a very nice addition to the car and most Parisienne optioned cars I have seen do have it when restored with the 348 triple 2 bbl carb option. The guidance on placement will therefore likely have to come from US manufacturing specification. Let's bear in mind that Canadian Pontiac's were very modest in using flashy fender flashes in this era, 348 and even 409 or 396 or 427 powered cars up to 1968 would have a modest V8 emblem just the same as a 283 car. 68's, 69's and 70's had the V emblems with engine displacements usually red in colour with chrome with only a few exceptions using black and gold. 1958 Parisienne sport coupe with 261 six. One of 525 built! Bob, this is such hi praise coming from you and I am humbled by your comments. We all have such affection and admiration of you and your encyclopedia of knowledge on the 58 Canadian Pontiacs. Please excuse me for answering this question ahead of your expertise, however, I was very confident in my answer and now you, our resident expert and likely the definitive expert has corroborated it. Thankyou! Had no idea Tri Power emblems and term were US only. I need to decide if I want to use them or not.They sure are pretty! As I mentioned they are a nice addition to our Canadian cars. I doubt that any cruise night lawyer would have this level of knowledge on the 58 Pontiac but to be safe I'd dremel off the mounting pins and put them on with two way tape. I wonder about the Fuel Injection badging on the Canadian cars. They were offered but were they actually built? Pontiac in the U.S. offered fuel injection on the '57 Bonnevilles with 347s & again on 370s in '58. 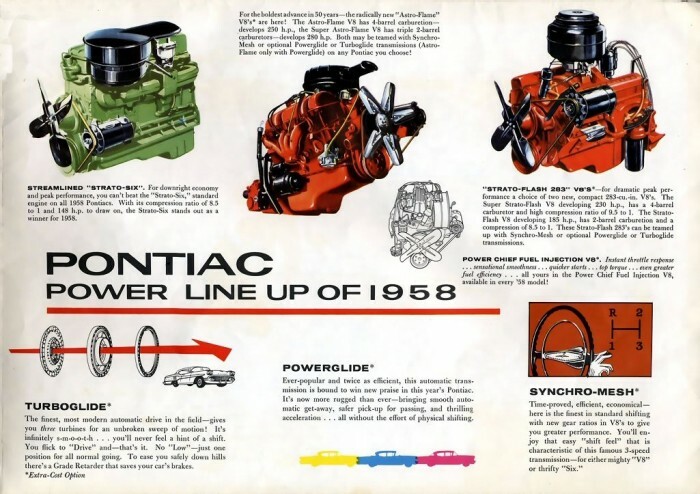 The Pontiac fuel injection experience was a flop, as was Chrysler's & AMC's in '58. Chevrolet had the best unit & reputation. The Canadian Pontiacs could piggy-back on the Chevy F.I. V8. The title for this thread is for 1958 but I assume you are talking about 1957 Cam? I dont think Chevy offered fi on a 58 Chevy, 57 and 59 yes, but not 58? Not even the vette? Vernon Smith in Nfld has a 57 and 58 fi us pontiac. He took my picture in the 58 vert, it had a factory am pull out radio in the dash which you could remove and use as a portable, I think it was called as sportable. Well, as a point of comparison, both actually. My '58 Canadian Pontiac brochure lists a fuel injected 283 Power Chief with 250 horsepower as an option, plus the Super Astro Flame 348 with triple 2-barrel carbs & 280 horses. Really? I just keep learning here! Has anyone ever seen a Canadian injected 58? How cool would that be? Indeed, the thread I created in 2009 and posted in the Library for everyone to reference has the 283 CID 1958 Power Chief FI engine included. My research was very exhaustive so its a good place to look whenever anyone has a engine question. If things are not clear I can always help with questions. Getting a bit off topic but what else is new ? The first Parisienne, offered for the 1958 model year, was a super deluxe "halo" model in the Laurentian line, much like Chevrolet's Bel Air Impala of the same year. Chevrolet's Ramjet fuel injection system, introduced in 1957 in the U.S., was a Parisienne option as well. It was marketed as the "Power Chief" option, but it was identical to Chevy's Ramjet. Also available for the first year Parisienne was Chevrolet's Turboglide automatic transmission.